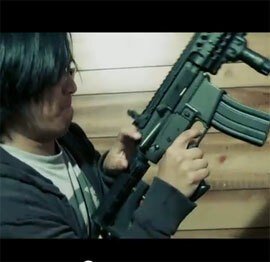 We’re big fans of film-maker Freddie Wong around here. Here’s a guy that utilizes his talent, built his own fan base and delivers cool stuff to us every week. He has two outrageously successful YouTube pages and his Facebook fan page updates are fun as hell. His work ethic is awe-inspiring. Instead of waiting for something to happen he’s gone out and built a cult following. He and his crew are amazing technical VFX wizards and great story tellers. On his main YouTube page he delivers a mini-movie every week or so. The shorts are usually darkly comic, filled to the brim with violence and often ending with a cute twist. The new generation of movie makers has embraced digital technology and are garnering huge followings by putting it out there directly to the audience. In Halloween Massacre Freddie pays homage to Being John Malkovich via Scarface. Since the 1990’s we’ve grown accustomed to special features on DVD’s that demystify the film-making process. Freddie embraces this and has built up a second YouTube channel that goes behind the scenes on all of his short films. He details how they accomplish all of the VFX and sometimes outlines the tools used. I always look forward to what he’s cooked up each week.